Home » Posts tagged with "cetaceans"
After nearly three years of delay and obstruction, a bill to ban keeping whales and dolphins in captivity has finally passed through the Canadian Senate. Senators voted to pass Bill S-203 late on Tuesday, and the legislation will now make its way to the House of Commons for further debate and voting. This groundbreaking legislation is now half-way to becoming law! The legislation bans keeping whales and dolphins in captivity, breeding them, as well as import and export. There are exceptions for legitimate rescue and rehabilitation efforts. Only two aquariums still imprison whales and dolphins in Canada—Marineland and the Vancouver Aquarium. The two aquariums fought the legislation at every stage, and pro-aquarium senators repeatedly attempted to kill, block, and delay Bill S-203. Most recently, Conservative Senate Whip Don Plett tried to amend the bill to exempt Marineland and the Vancouver Aquarium, which would have made the legislation meaningless. Senator Don Plett’s delay tactics were finally defeated on Tuesday, and at last the bill was allowed to come to a vote. Animal Justice has been fighting to help pass this bill from the beginning. Bill S-203 enjoys broad public support from Canadians, and it was saved more than once by the incredible advocacy of people who emailed senators, made phone calls, and shared information about Bill S-203 on social media. In June 2017, the Senate email system was swamped by emails from the public when it looked like pro-aquarium senators were mobilizing to kill the bill. Bill S-203 has also attracted support from politicians of all political stripes. 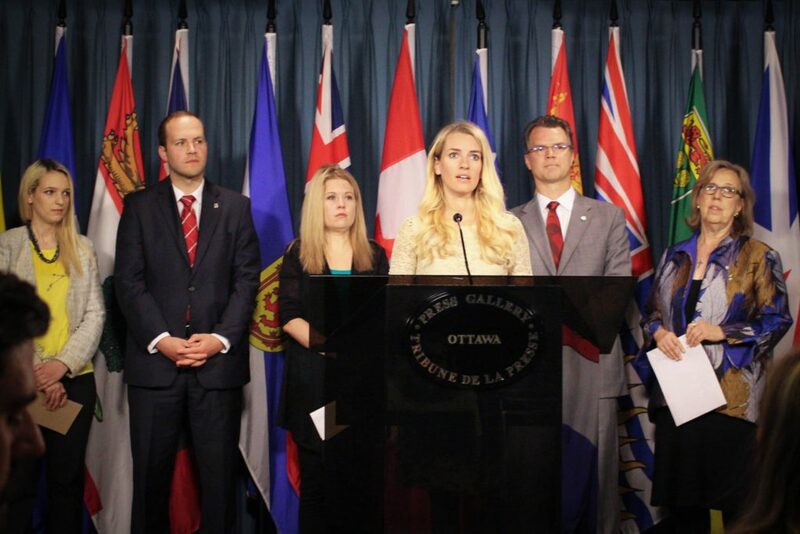 Earlier this year, Members of Parliament from the Liberals, Conservatives, NDP, and Greens joined Animal Justice and Humane Society International at a press conference to call for an end to Senate obstruction so the bill could move to the House of Commons. Bill S-203 was first introduced in December 2015 by Senator Wilfred Moore. After Senator Moore’s retirement, it was sponsored by Senator Murray Sinclair. Green Party leader Elizabeth May will sponsor the bill in the House of Commons. Over a dozen other jurisdictions around the world have already banned keeping some or all cetaceans in tanks, including Mexico, France, South Carolina, and California. Ontario banned keeping orca whales in 2015, and the Vancouver Park Board voted to ban cetacean display and captivity at the Vancouver Aquarium in 2017. The ban is now being challenged in court, but in the meantime, the Vancouver Aquarium publicly promised to end its practice of keeping whales and dolphins in captivity. There is also hope for rescued whales and dolphins once the ban becomes law. The Whale Sanctuary Project plans to build a seaside sanctuary for retired whales and dolphins in Nova Scotia, British Columbia, or Washington, offering hope to creatures who have spent a life confined in miserable concrete tanks. 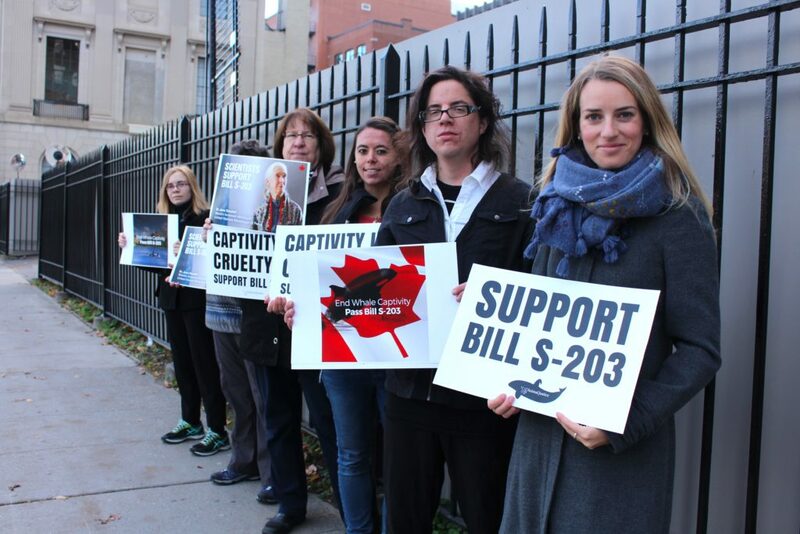 OTTAWA – National animal law organization Animal Justice is applauding the Senate for passing Bill S-203, the Ending the Captivity of Whales and Dolphins Act. If passed, Bill S-203 would outlaw keeping whales and dolphins in tiny concrete tanks for display. After passing Bill S-203, the Senate also voted in favour of Bill S-238, the Ban on Shark Fin Importation Act, sponsored by Conservative Senator Michael MacDonald. Bill S-238 also has strong support across party lines. VANCOUVER – National animal law advocacy organization Animal Justice is responding to the decision from the B.C. Supreme Court quashing, in part, a municipal bylaw aimed at preventing whales and dolphins from suffering in captivity at the Vancouver Aquarium. The Aquarium sought to overturn the Park Board bylaw passed in May, 2017 that bans confining whales, dolphins, and porpoises in Vancouver parks, including the Aquarium in Stanley Park. The Aquarium argued that it had a constitutional right to confine whales and dolphins. Animal Justice and Zoocheck focused on dismantling the Aquarium’s troubling legal claim that confining cetaceans is a form of expression protected under section 2(b) of the Canadian Charter of Rights and Freedoms. The groups argued that confining whales is harmful and violent conduct not deserving of protection. The Court decided that the anti-captivity bylaw did not apply to the Aquarium because of a licensing agreement signed between the Park Board and the Aquarium in 1999, which runs until 2029. In other words, the case hinged on an issue of contractual interpretation. The Court declined to consider the issue of free expression as it was not necessary to decide the case. On January 18, 2018 the Aquarium announced that it would stop confining whales and dolphins after public pressure. “The Aquarium made the disturbing claim that it has a constitutional right to keep sensitive, intelligent marine mammals in tiny tanks, a practice Canadians no longer find acceptable. The Aquarium’s freedom of expression claim could have permanently undermined animal protection laws right across Canada. We are pleased that the Court did not grant this right, and that other governments remain free to pass laws protecting animals. “Ultimately, the Vancouver Aquarium was already forced last month to end its whale and dolphin captivity program due to public outrage over this cruel and outdated practice. A little over one year ago, there were five whales and dolphins at the Aquarium. Today, only one remains alive. We are pleased that no further vulnerable cetaceans will languish in captive misery at the Aquarium. Animal Justice is a national animal law non-profit that leads the legal fight for animals in Canada. Zoocheck is a Canadian-based international charity that works to protect wild animals in captivity and in the wild. Animal Justice and Zoocheck were represented by lawyers Arden Beddoes of Arvay Finlay LLP, and Benjamin Oliphant of Gall Legge Grant Zwack LLP. The B.C. Supreme Court decision in Ocean Wise Conservation Association v. Vancouver Board of Parks and Recreation 2018 BCSC 196 is available here.